:The values of the nonnegative functions W[(s) and w2(s) determine the extent to which the snake can stretch or bend at any point s on the snake. For example, increasing the magnitude of W[(s) increases the "tension" and tends to eliminate extraneous loops and ripples by reducing the length of the snake. Increasing w2(s) increases the bending "rigidity" of the snake and tends to make the snake smoother and less flexible. 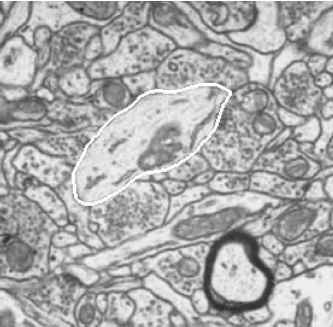 Setting the value of one or both of these functions to zero at a point s permits discontinuities in the contour at s.
FIGURE 1 Snake (white) attracted to cell membrane in an EM photomicrograph . Although it is natural to view energy minimization as a static problem, a potent approach to computing the local minima of a functional such as (1) is to construct a dynamical system that is governed by the functional and allow the system to evolve to equilibrium. The system may be constructed by applying the principles of Lagrangian mechanics. This leads to dynamic deformable models that unify the description of shape and motion, making it possible to quantify not just static shape, but also shape evolution through time. 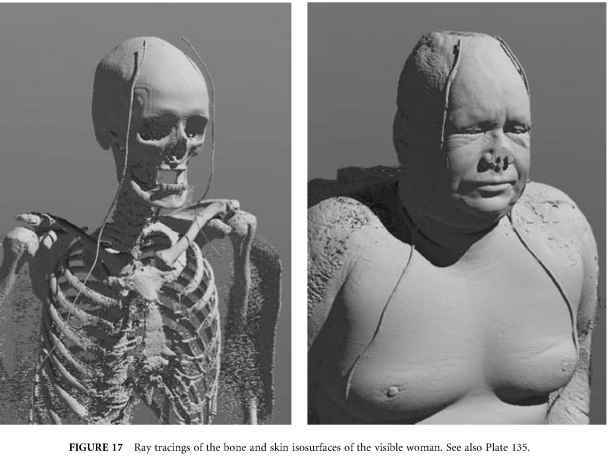 Dynamic models are valuable for medical image analysis, since most anatomical structures are deformable and continually undergo nonrigid motion in vivo. Moreover, dynamic models exhibit intuitively meaningful physical behaviors, making their evolution amenable to interactive guidance from a user (Fig. 2). The first two terms on the left-hand side of this partial differential equation represent inertial and damping forces. 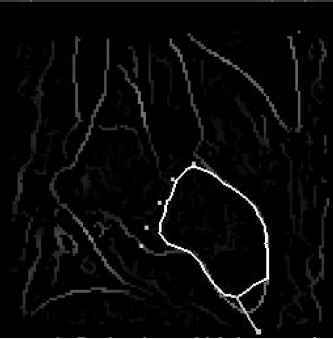 FIGURE 2 Snake deforming toward high gradients in a processed cardiac image, influenced by "pin" points and an interactive "spring" that pulls the contour toward an edge . where P(x, y) denotes a scalar potential function defined on the image plane. To apply snakes to images, external potentials are designed whose local minima coincide with intensity extrema, edges, and other image features of interest. For example, the contour will be attracted to intensity edges in an image I(x, y) by choosing a potential P(x, y) = —c|V[Ga * I(x, y)]|, where c controls the magnitude of the potential, V is the gradient operator, and Ga * I denotes the image convolved with a (Gaussian) smoothing filter whose characteristic width a controls the spatial extent of the local minima of P.
This vector-valued partial differential equation expresses the balance of internal and external forces when the contour rests at equilibrium. The first two terms represent the internal stretching and bending forces, respectively, while the third term represents the external forces that couple the snake to the image data. The usual approach to solving (4) is through the application of numerical algorithms (Section 2.3). Referring to (4), the remaining terms represent the internal stretching and bending forces, while the right-hand side represents the external forces. Equilibrium is achieved when the internal and external forces balance and the contour comes to rest (i.e., dv/dt = 82v/8t2 = 0), which yields the equilibrium condition (4). where f is the generalized external force vector. where M is the mass matrix and C is a damping matrix. The time derivatives in (5) are approximated by finite differences, and explicit or implicit numerical time integration methods are applied to simulate the resulting system of ordinary differential equations in the shape parameters u. An alternative view of deformable models emerges from casting the model fitting process in a probabilistic framework. This permits the incorporation of prior model and sensor model characteristics in terms of probability distributions. The probabilistic framework also provides a measure of the uncertainty of the estimated shape parameters after the model is fitted to the image data . expresses the posterior probability p(u|I) of a model given the image, in terms of the imaging model and the prior probabilities of model and image. where P(u) is a discrete version of the potential ^(v) in (3), which is a function of the image I(x, y). Models may be fitted by finding u that locally maximize p(u|I) in (9). This is known as the maximum a posteriori solution. With the preceding construction, it yields the same result as minimizing (1), the energy configuration of the deformable model given the image. The probabilistic framework can be extended by assuming a time-varying prior model, or system model, in conjunction with the sensor model, resulting in a Kalman filter. The system model describes the expected evolution of the shape parameters u over time. If the equations of motion of the physical snakes model (8) are employed as the system model, the result is a sequential estimation algorithm known as "Kalman snakes'' .